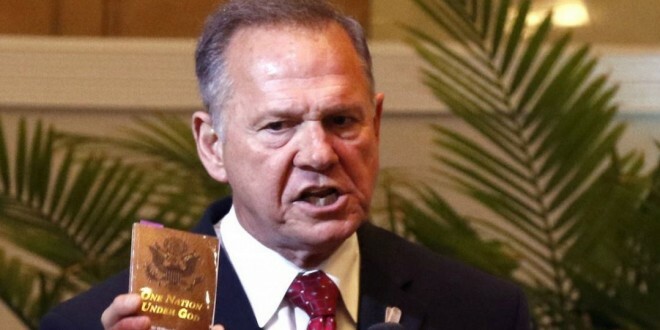 Washington Post: Roy Moore Is Unfit To Serve - Joe.My.God. It is cliche to say that Mr. Moore’s strange rise has been fueled by anti-Washington anger. Yet electing Mr. Moore would be a sure way to worsen Washington’s problems. His unapologetic extremism would pour gasoline on the already raging fire of partisanship and dysfunction. Mr. Moore repeatedly forced the Alabama Supreme Court into unwinnable fights on tangential side issues, rather than keeping the institution focused on its job. If you think the Senate has failed to attend to the country’s real problems, just wait until he gets there. Mr. Moore spins up “facts” to serve his worldview, as when he claimed that sharia was in force in Illinois or that the law required football players to stand for the national anthem. He called for a de facto religious test when he argued that Muslims elected to represent their communities should not be seated in Congress. This would have appalled the Founding Fathers and should alarm believers of all stripes. Hit the link for the piece.